What we forget in this eternal search, is that peace is the very nature of our mind and is always there, waiting to be noticed. If you feel like you'd like to learn more about meditation and practice in a group, then this course is for you. And even more - it is a chance to reconnect with your Heart and to remember Who you are! 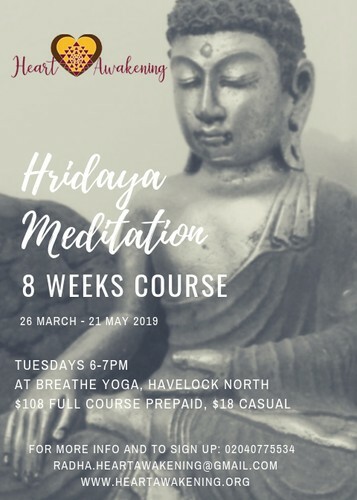 The Hridaya (Heart) meditation course consists of eight meditation classes over an eight weeks period. Each class includes some theory/ technique presentation, practice and time for discussion and questions. It is suitable for beginners, aspiring to start a meditation practice, as well as for long-time practitioners wanting to enrich and refresh their experience. Hridaya Meditation is a path of revealing our fundamental essence of stillness, or the Heart, as it was referred to in some of the meditative traditions. This approach makes it easy to fall in love with meditation and to connect with our essence. It can gradually remove the layers of conditioning, allowing our true nature to shine forth bringing us closer to who we really are. Such process can bring joy and lightness to our days and can enable us to discover a greater purpose of living with an open heart. If you have done one of the previous 8 week courses with me and you'd like to keep up your practice in a group or to refresh your knowledge, you can join in for as many sessions as you'd like for Koha donation.